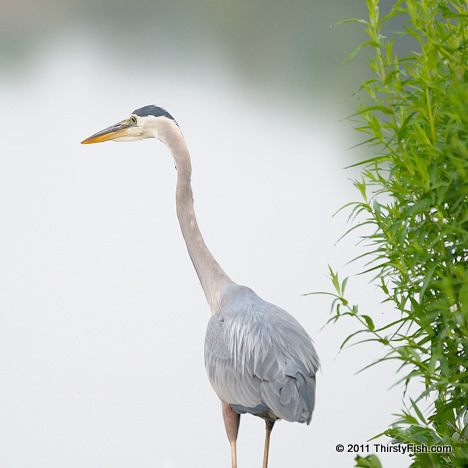 The Great Blue Heron is a wading bird in the same family as egrets, bitterns and other herons. It is the largest heron in North America. Herons eat a wide variety of aquatic animals, fish, reptiles, amphibians, crustaceans, molluscs and aquatic insects. "I think, therefore I am" is a statement by the Father of Modern Philosophy Rene Descartes that implies, questioning whether or not we exist is the proof that we do. Descartes also suggested that animals could not reason and therefore were Automatons - self operating complex machines. In the recent years, the question of Animal Consciousness has increasingly been the subject of philosophical debates and scientific studies, but remains unanswered. The answer is simple. Either the Heron has a consciousness or we humans are also Automatons. We are not all that much different.